Who is on Your Website Right Now? After only a 5 minute install, you will be receiving real time updates of the visitors to your website. No Maintenance. No Consultants. No Implementation. We do all the work, all you need to do is follow up on those leads and close the deal! Website visitor tracking will help identify visitors to your website by name. We tell you which of your products or services they are interested in. 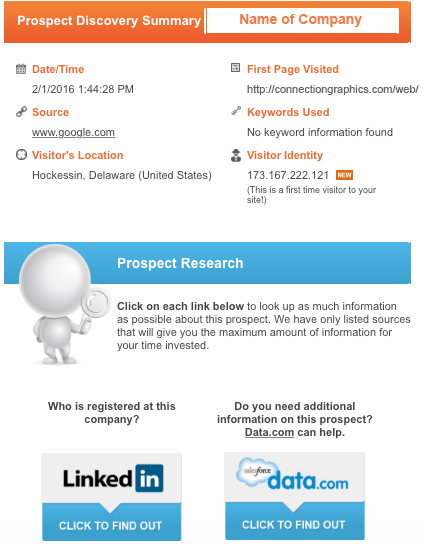 Anonymous Visitor Identification is your website visitor tracking tool for real time sales leads. By identifying visitors to your website, and receiving their contact information, you can impact sales and your bottom line. Designed to be easy to use, all you have to do is wait for your website visitors to show up. It can even tell you which search engine and term they used to find you. It really doesn’t get any easier than that. Who, What, Where, When. In sales, timing is everything. Getting to prospects when they are in the research phase increases your chances of closing the deal. Did you know that only 1 to 2% of all visitors will ever complete a contact form or pick up the phone to call? We get you in contact with the other 98%. Visitor Tracking is easy, simple and automatic. Once installed, all you need to do is follow up on the emails sent to your sales team. Visitor Tracking runs transparently in the background of your website, gathering data without alerting visitors and eliminating the need to fill out tedious registration forms or logins.